I heard that J Lo insured her booty for $27 million dollars. That seems excessive but when my voice crapped out during class on Thursday, I started pondering if I should insure my voice. I mean…it’s not a great voice, but I do use it A LOT. And what’s a language teacher without a voice?! It was the weirdest thing…I went to bed Wednesday night feeling fine. Woke up Thursday morning with just the slightest hint of a sore throat, then during 1st period I croaked out a few words and then went silent. Luckily this happened while my little darlings were in the middle of their Celebration of Knowledge (That’s what we call tests around here) and thankfully I had recorded the listening portion of the test. BUT, I was planning on playing Mafia with my little darlings afterwards…which absolutely would not work with a silent teacher. While they were working away on their tests…errr…celebrations of knowledge, I was racking my brain. What could they do that required like no voice from me and no prep, because remember, this came on totally out of the blue!! There’s always FREE READING, which I love, but again, they had been working silently for 45 minutes…Free Reading would be a tough sell. And there’s no way my Wild Freshmen would read for the rest of the period…no matter how sorry they felt for me and my froggy voice. I thought…to heck with it! I’ll just put a video on. Who cares about Comprehensible Input anyways?! I’m dying here. They’ll survive. It will be fine. And my blog readers will never know…BUT that wouldn’t work either! Because our department has a nice little library of Disney Movies and Travel Documentaries in our lounge, but I don’t have a single one in my classroom! And like I said, my voice taking a sudden vacation totally caught me by surprise. No time to run to the lounge and grab Los Increíbles. So, there I was, madly ripping though my mental Rolodex looking for something to do when they finished their test, pounding hot tea and hoping that maybe my voice would return as quickly as it left. The tea didn’t work, but inspiration struck none-the-less. Mike Peto has an awesome template for making storybooks, but of course there was no time to make copies. BUT, desperate circumstances call for desperate measures, so I just passed out printer paper to everyone, mimed what they should do and croaked out a few instructions. They folded their paper “hamburger style” and copied a story that I typed on the screen. Think Write and Discuss minus the discuss element. We had MovieTalked the SOY YO music video the previous class so I typed out the story on my screen and indicated which “page” they should copy it on to. I typed. They copied. They translated with their partner when I signaled. It worked! Even my rowdiest classes complied beautifully! Miracle of Miracles! They must have felt sorry for me! Thank you, Jesus! Since I was typing, I just kept my eye on the time. I typed they copied until there were 10 minutes left…then they finished up the class period by illustrating their “books”. Which they took home to “read” to their parents for extra credit. Was it perfect input? No. Was it better input than watching a Disney movie? Yes. Did it keep them engaged? Yes! Did it get me though the day without any voice? Yes!!! 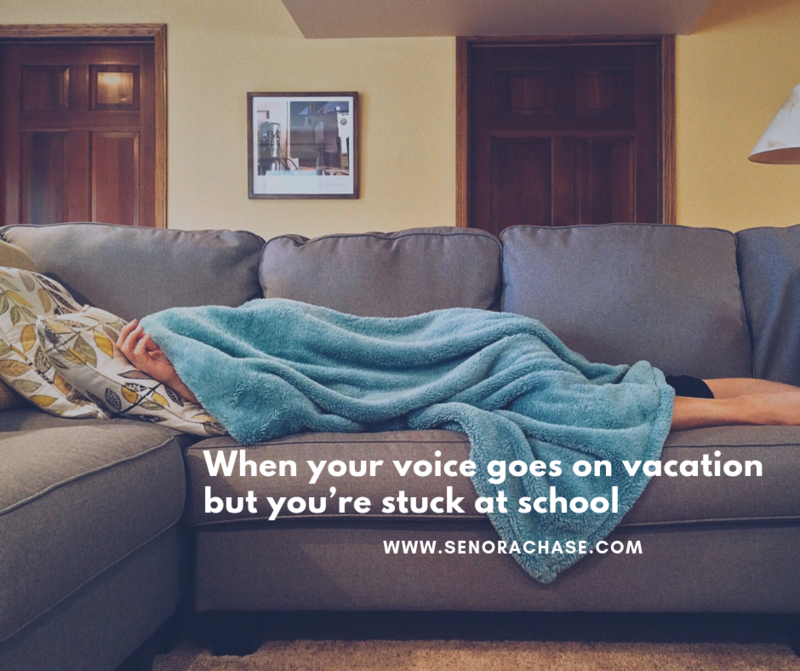 So…tuck that idea away for the next time your voice goes on vacation but leaves you behind with your little darlings! And even if you hadn’t just done a Movie Talk, I think you could still make it work: Show a movie clip, type it out, save your voice. And while this worked wonderfully on Thursday, I didn’t want to press my luck on Friday. I am so lucky to have a retired CI teacher (and Nevada Teacher of the Year!) who subs for me, so I slept while Julie cared for my little darlings. ¡Muchísimas gracias amiga! The next time you find yourself writing sub plans, here’s an idea…it’s easier to write the plan for your kids, not the sub! You’re welcome my friend. 😊 It was a good day with your darlings.